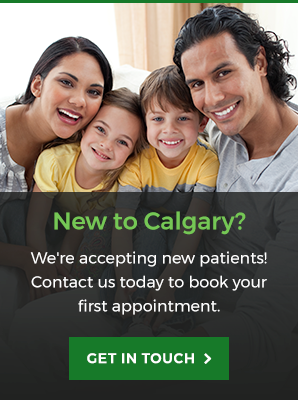 If you’re looking to improve your at-home brushing and flossing routine, our Calgary dentists can help! Here are our top 5 tips for at home oral hygiene. While professional dental cleanings are important for removing built up tartar on your teeth, a thorough at-home oral hygiene routine is essential for keeping that tartar at bay in in the first place. The following tips will help you make the most of your brushing and flossing routine, and keep your teeth clean between dental appointments. You probably know that you should be brushing your teeth for at least two minutes at a time, twice a day. You may be trying to guess approximately how long two minutes is when you brush, but it’s probably longer than you think! To make sure you’re getting in two full minutes of brushing time, use a stopwatch, or the timer on your phone, set to two minutes. Bonus tip: Try an electric toothbrush. Most electric toothbrushes have built in timers, and buzz or vibrate after they’ve been running for two minutes. Divide your upper and lower jaws into four equal sections mentally: upper left, upper right, lower left, and lower right. During your two minutes of brushing, aim to spend about 30 second brushing the fronts, backs, and chewing surfaces of all the teeth in one quadrant, before moving on to the next. To get the most out of your flossing, don’t just saw the floss up and down between your teeth a couple of times. Instead, pull the floss into a c-shape around a tooth, and gently move it up and down the sides. Then repeat the same steps on the other tooth by pulling your floss into a c-shape in the opposite direction. This will help ensure that each tooth gets a careful cleaning. If you tend to forget to floss after brushing your teeth, you’re letting bacteria and food particles linger in those tight areas. This can result in tooth decay and bad breath over time, so it really is important to try to remember. If you have trouble remembering to floss, start leaving your floss out in plain sight, somewhere you’re sure to see it. Ideally, keep it right next to your toothpaste and toothbrush. Your toothbrush is a hardworking tool, and it will begin to wear down pretty quickly. You should replace your toothbrush every three months at a minimum, but more frequently if it starts to show wear sooner. To help you determine when to replace your toothbrush, take a good look at it. If the bristles are bent, frayed or flattened, it’s probably time to get a new toothbrush. Many toothbrushes have bristles that are blue in colour. The blue will start to fade over time, and when it’s about half gone, you should replace your toothbrush. For more tips on brushing and flossing, and how to get the most out of your oral hygiene routine, contact our Calgary dentists today.